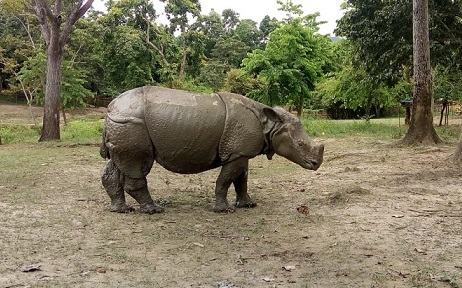 A rhino calf, which had been under the care of the Centre for Wildlife Rehabilitation and Conservation (CWRC), located near a tea estate and the Kaziranga National Park, since 2016, died on Monday evening. The veterinarians of the Centre for Wildlife Rehabilitation and Conservation suspected that the rhino calf might have died due to snakebite. The rhino calf was taken to the CWRC for treatment in 2016 during floods. The two-and-half-years old orphaned rhino calf had been grown along with other rhino calves under the care of the veterinarians of the CWRC. However, for confirmation of the actual cause of death, the veterinarians would conduct autopsy of the dead rhino calf on Wednesday. It may be mentioned that CWRC is the only facility in India where orphaned or injured wild animals of several species are hand-raised and treated. Those animals later are sent back to the wild subsequently. The CWRC is located in Borjuri village, adjacent to the Panbari Reserve Forest near Kaziranga National Park. The CWRC veterinarians attend to a wide range of wildlife emergencies resulting from natural or anthropogenic causes. It was launched in 2002.